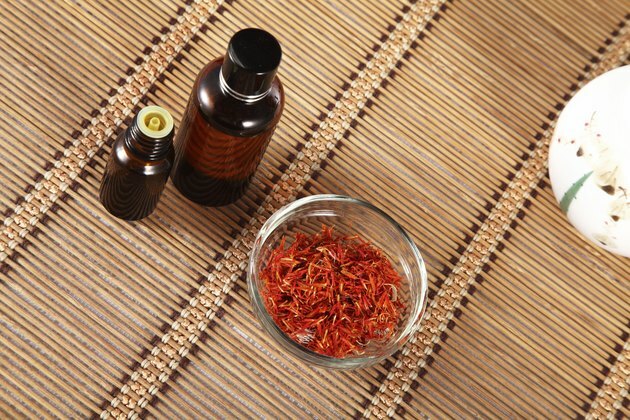 Safflower oil is a favorite in natural skin care because it is a botanical alternative to synthetic emollients. Extracted from the oil of safflower seeds, the oil is a potent hydrator and ideal for dry, sensitive complexions. Safflower oil contains lubricant properties that prompt the skin to retain water and moisture. According to “Milady’s Skin Care and Cosmetic Ingredients Dictionary” by Natalia Michalun and M. Varinia Michalun, the oil consists primarily of linoleic acid, an omega-6 that is packed with essential vitamins. Safflower oil prevents dryness and roughness and removes dirt and oil. Its content makes safflower oil a key treatment for issues including eczema, psoriasis and acne. Its hydrating properties lend skin a healthy glow, promote elasticity and reduce the appearance of wrinkles.